What follows is a proposal for how to extend the strike unfolding in West Virginia. To hear an interview with a striking teacher, go here. This post first appeared on It's Going Down. The statewide strike of teachers in West Virginia that started on February 22nd is a model for teachers and other working-class people across the US of how we can struggle together for what we need. It is a desperately needed example of mass working-class solidarity in a time when the rich are attempting to fracture us even more. It is also an important model of the kinds of strikes we can wage when we realize that the existing labor laws (the same ones that the rich are trying to destroy anyways) are traps designed by the rich to tie our arms behind our backs and hold us back. Some teachers and supporters in West Virginia are organizing through the IWW to spread a revolutionary unionist perspective in the current strike, to expand the strike and strengthen the militant mood of the teachers, and to build for long-term organization that is not reliant on politicians or bureaucrats. They will begin by distributing a leaflet to encourage teachers and other members of the working class to extend and expand the current struggle, and they will be looking for openings to expand on that organizing. ]You can support their organizing by donating here. Funds raised will be used to print agitational materials, to cover travel costs related to organizing, to rent spaces or cover child-care for meetings, and to cover other costs related to building a militant and organized presence among teachers and working-class people in West Virginia. The text of the leaflet they will be distributing is below. We also welcome anyone in West Virginia, or any teachers anywhere, or anyone else, to download the PDF and distribute it in your workplaces, schools, churches, and neighborhoods. Jim Justice and the Republican-dominated legislature seek to cut state funding to the Public Employees Insurance Agency (PEIA), increasing premiums over the next several years, and eliminating teacher seniority while opening up the possibility of charter schools to privatize public education in areas in most need of quality public servants. The goal for this legislature is to utterly decimate public sector labor, reap obscene profits through private charter school investments which lack accountability measures, and ultimately reduce the quality of education in the state. We know that both Democrats and Republicans no longer have a need for a highly-educated workforce. Instead, they seek to create a system of obedient workers who can perform the menial tasks asked of them by their corporate masters without questioning the powers that be. Careers that provide meaningful employment with a steady wage and quality health care no longer exist for the many. They have been replaced, over the course of the past few decades, with a series of half-hearted promises by both parties. If we do not act NOW to halt this reactionary legislation, we will ultimately lose our future – our children’s future – to big business and the corporate-controlled parties. In sum, we face the daunting challenge to confront elitism in our political party system and the legislation they seek to create. BUT, we cannot create a new destiny simply by voting out one party and replacing it with another. For substantive change to occur, we must FIRST organize around our common destiny as workers. Almost as soon as Justice and the Republicans announced their plans to cut funding to PEIA while refusing to negotiate a public employees’ pay raise, everyday workers jumped into action without waiting to be told what to do. The capitol building saw an influx of teachers dressed in scarlet red as independent mutual support networks began to grow to serve the needs of people in those communities. The everyday union member gave a shining example of what can be done when anger is coupled with education and organization. 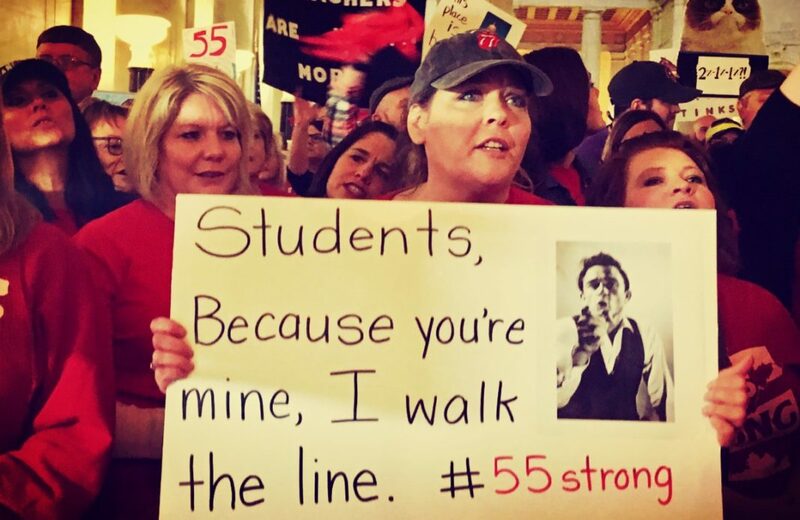 Through independent, grassroots means, common teachers began developing strategies for providing food to families in need, chartering buses to travel to the capitol, and begin mass picketing across the state. The capitol rotunda was inundated with a sea of red as educators flooded into its halls to demand action for ALL public employees’ concerns. Solidarity efforts across the state continued as food, water, and coffee was distributed to picketers who equally demanded that the legislature listen to the concerns of public sector employees and fully fund PEIA. From the Maine to California and the Philippines to France, educators around the world have shown that they support the efforts of ALL public employees in West Virginia. The eyes of the world are watching the people of West Virginia, hoping for a working class victory. It is not enough to hope, we need to believe. If enough of us are united, we will win. We must build on what we’ve already accomplished. We must look at the legislature’s plan in the context of the last several decades. Nearly every job that can be automated or sent overseas has been outsourced, so that what 10 workers once did in Charleston or Wheeling in 1970 is now done by 3 or 4 poorly-paid workers in Mexico or China, pitting “us against them” in a race to the bottom. Workers in retail and service jobs, some of the only jobs in the US that can’t be outsourced, have usually been defeated when they’ve tried to organize for decent pay and benefits. These decades of defeat have created the “Rust Belt,” a region with few living-wage jobs where many people rely on social assistance. Justice and his Republican lackeys are trying to destroy support networks for those whose communities are already in crisis and they are working to crush the power of public employees, one of the last groups of workers that has managed to resist cuts and retain a decent standard of living. We didn’t create this situation, but we can change it, as long as we remember where our strength lies: in our UNITY. “Workers united will never be defeated,” we chant – for good reason. Educators across the state have continued on a walkout in opposition to Republican legislation that would harm ALL public employees in the short – and long-term. Educators realize that other public sector employees may not have the resources available to strike, and thus have determined that they will continue to fight until ALL public employees receive the demands they so justly deserve. With the rollout of Go365 – a privatized model of health care – public employees began a sustained campaign to defeat this reactionary model for health care, one that would award “points” to those who had the privilege to attend gyms on a regular basis. From there, public employees have been on a sustained campaign to force the legislature to increase a natural gas severance tax so that a permanent revenue stream for PEIA can be found, while increasing pay for ALL public employees – including school cooks, janitors, bus drivers, Department of Highway workers, etc. The problem is that Democrats have now begun using this grassroots energy to claim that their party “stands with public employees” and will continue to fight for teachers when elected. We know that the Democrats in this state, too, have allowed for this system of oppression to continue, doing little to increase funding for PEIA or teachers’ salaries over the decades of their dominance in the legislature. We CANNOT allow either party to co-opt the strike and transform it into their own narrative. The strike was begun by everyday teachers and public employees — its course should be determined by them as well. Workplace-centered collective action is the strongest way to move forward, and would be far more effective than simply switching one group of politicians for another. Before laws were passed in the ‘30s and ‘40s that institutionalized labor unions, the most effective organizing tactics avoided formal union recognition and automatic dues check-off. Unions were less of a faceless service provider and more connected to the shop-floor. Solidarity unionism affirms the central role of rank-and-file initiative in workplace change. It stands in opposition to what has been termed “business” or “service-provider” unionism: the idea that a worker joins a union to obtain material benefits in exchange for monthly dues payments, much as the worker might buy an insurance policy. In solidarity unionism, workers carry out their own organizing. There are three fundamental principles: 1. Rank-and-file control (every worker has an equal say in the positions/actions of the union); 2. Direct action including, but not limited to, strikes, work slowdowns, and pickets; 3. Members carry their union membership with them, regardless of majority status, when they move on to other jobs. With the end of formal collective bargaining, solidarity unionism may be the only route public sector workers have to address grievances in the workplace. Sit-ins, confronting management in large numbers, slow downs, work-to-rules, pickets, “quickie strikes”; these are all successful tactics that were used by auto workers and longshore workers in Michigan and Califonia in the 1930s and continue to be used by fast food and retail workers in Oregon and North Carolina today. These tactics, up to and including a general strike, can help us to rebuild the working-class solidarity that will be necessary for us to eventually defeat the ruling-class agenda imposed on us. Public-sector workers are the primary targets of this Republican legislature. If we allow them to strip us of our rights, it will destroy the power of one of the last group of workers in the U.S. who have been able to maintain a decent standard of living by resisting cuts during the economic upheaval of the last thirty years. Additionally, the consequences of these actions will affect anyone who uses public services. That is why we must fight back. The protests in Charleston gained significant momentum after the Martin Luther King, Jr. Rally Day. If all public-sector workers take action, they can inspire the rest of the state to move with them. Try to identify people who are sympathetic to the idea of collective action. Form mobilization committees and link up with like-minded groups or individuals. Build a contact list. Discuss strike preparations at your local, but be prepared for opposition from the international. Organize mass meetings with your co-workers, regardless of which union they’re in, so that you can strategize together. Private-sector workers are being told that our economic problems are a result of ‘greedy public employees’ defending their health care and pensions. These ideas are being pushed in order to divide us; with workers pitted against each other, we are all weaker, and the politicians and bosses know it. Instead of blaming each other, we should be united by our common interests. We should all have decent health care, living wages, and a dignified retirement – and we can, if we fight together for these demands. Unionized workers can mobilize at their local to support collective action, and all private-sector workers should begin meeting with their co-workers to discuss their own demands and strategy. With all of the public discussion of unions and workers’ rights, non-unionized workers have a perfect opportunity to organize at their own jobs – especially if they use the “solidarity unionism” tactics discussed above, rather than the legalistic strategies that have led us to the current mess. This is an important moment in history; let’s seize this opportunity to go on the offensive. Unionized workers can build their power and show that they are a force to be reckoned with. Non-unionized workers from any sector, industry, or company can organize and demand the living wages, rights, and benefits that so far have been denied to them. Students can play a vital role in mobilizing for working-class solidarity. The economic crisis is shortening the gap between students and workers — many students are also workers, and prospects for graduates are becoming bleaker. Already, West Virginia students have been threatened by their universities for supporting educators. Students must continue their support in order to protect our teachers, our university staff, our families, and our futures. Our tuition and tax dollars fund the universities, so let’s reclaim the campus for ourselves! We should begin organizing for student strikes, build connections with co-workers where we hold jobs, organize rallies in defense of students targeted by the administration, and prepare to walk picket lines in solidarity. It is us, the young people, who have to live with the future consequences of today’s cuts, and for that reason alone, we MUST step up with all workers. Everyone – union and non-union workers, students, unemployed, farmers, retirees – is affected by this legislature, and we can all begin preparing to support collective action in other ways. Religious communities can prepare plans for “Freedom Schools” alongside a teachers’ strike or kitchens to feed strikers. People should also begin organizing mobilization committees within their communities and make plans to support eventual picket lines, in order to show any scabs or police that strikers have community support. We can defeat this anti-union legislature and all of Justice’s attempts to divide us, and change our society for the better, if we continue to act together and return to the roots that our unions were built on. This will not be easy, and may even be scary, but if we just sit on our hands those in power will cut until we have nothing left. Those in power can intimidate us and pit us against one another, but, as Ralph Chaplin said in Solidarity Forever, “without our brain and muscle not a single wheel could turn.” If we act together, we have the power to resist these cuts, we have the power to go on the offensive, and we have the power to win. Connect with West Virginia IWW here. The statewide strike of teachers in West Virginia that started on February 22nd... is an important model of the kinds of strikes we can wage when we realize that the existing labor laws... are traps designed by the rich to tie our arms behind our backs and hold us back.